After spending a few days renting movies from the Internet, I’m no longer convinced that the DVD’s future is any safer than its compact disc cousin. Chapter selection, deleted scenes and commentary – everything’s there, and without the $4.00 a gallon drive to Blockbuster. Netflix customers already save on fuel costs, but waiting for the mailman can be tiresome. So the just-announced Netflix Player, a set-top box that works with most any TV, intrigues me. 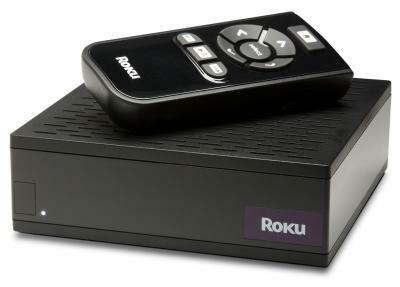 The device, made by Silicon Valley startup Roku, isn’t the first of its kind by any means. Apple TV pairs with iTunes for movie rentals, and the Xbox connects to a Microsoft video store as well. Tivo hooks into Amazon Unboxed – it’s a growing field. What makes the Netflix Player interesting is the way it mirrors, and extends, their existing service. Customers who already pay one price for an unlimited number of mail order discs can now can do the same with Netflix online for no additional charge. It’s a bit like Rhapsody, the music subscription service, and may inspire a bit more risk-taking with film selection. If one flick doesn’t agree with you, another one is but clicks away. That’s quite a contrast to other high priced rentals. For example, six dollars for an Xbox HD movie doesn’t encourage dabbling. Netflix has over 10,000 streaming titles – unfortunately, there’s not a lot of recent ones. That should change over time. The best news is the cost of the player – $99, which beats the competition by more than half. The Netflix Player doesn’t have built-in storage, which concerns me a bit. My iTunes movie rentals were lag-free, with pristine picture quality, because I downloaded them first. Early reviews of the player suggest a faster-than-average broadband connection is essential to enjoy it properly. But it’s early, so my excitement is focused more on the gadget’s promise than with what it does now. There’s no HD content or surround sound, that’s a minus. But with a picture size toggle switch, it also doesn’t require a widescreen to work. It could be a nice addition to a bedroom TV, providing on-demand entertainment for less than a cable box rental fee. Best of all, it’s all you can watch, and when the red Netflix envelope arrives with a DVD, the living room flat panel is just a few steps away. Now, what about the best destinations for live music in the coming days? Thursday: Dan Weintraub, Murphy’s on the Green – Look up “prolific” in the dictionary and you’ll probably find this man’s shiny-headed visage smiling back at you. Weintraub’s tunes range from funny to poignant, and there’s 70 of them on his website, all recorded in the last year and a half, each a free download. Mix Randy Newman with Tom Petty, add a dash of Weird Al – that’s Dan. Saturday: Roxanne & the Voodoo Rockers, Anchorage – A sure sign of summer is the return of live music to Lake Sunapee. Memorial Day weekend includes this bluesy band, a favorite around the harbor. They have a pair of Newbury Gazebo performances slated for later in the season. Mark and Debbie Bond, familiar from several area bands (including Last Kid Picked), perform at Anchorage Sunday. Bond’s CD, “Broken,” is a real treat. Sunday: Kurtis Kinger, Bentley’s – This singer-guitarist specializes in crunchy blues numbers mixed with straight ahead rock. I don’t know much about him, but some of his music is up on the Yellow House Media site. Yellow House recently debuted a cable access show featuring local musicians called “Homegrown.” The first guest is accordion/keyboard player Jeremiah McClane (it’s also streaming on the site). Tuesday: Submarines, Iron Horse – John Dragonetti and Blake Hazard met in Boston, joined a band and toured Europe together, fell in love, moved to LA and broke up four years later. Their musical paths kept crossing, and it turned out both of them were writing sad tunes about missing each other. Now they’re married, and their songs are much happier – “You, Me and the Bourgeoisie” deserves its own iPod ad. Wednesday: Van Halen, Verizon Wireless Arena – This show was postponed and rescheduled from earlier this year, which means tickets have been available for close to 6 months, and it’s not even sold out. The biggest reunion tour of 2007 is old news in 2008. To paraphrase Boz Scaggs, there’s a breakdown dead ahead for the concert business, and it serves them right. I enjoyed your ‘review’ of the new Netflix $99 DVD program.. I was disappointed that the new releases were not plentiful, but, as you say, I am sure it will come. Thanks for the review.